Rain, rain, go away! Come again another day! Did you used to chant that as a kid? But if you want to know the real truth, kids LOVE playing in the rain. Stomping, splashing, jumping in puddles. 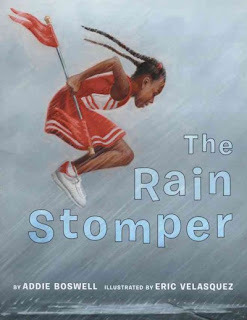 I adore sharing Rain Stomper, a fun, high-energy picture book, and it would make a great gift along with a new pair of spiffy rain boots. Jazmin was so excited - she was all set to twirl her baton in the big neighborhood parade. Everyone would dance and celebrate together. But then, the clouds started rolling in. Would her special day be ruined? Jazmin threw open her front door. Wind whistled through her hair. The sun scuttled behind the clouds. The sky twisted into a thick, black coil. The rain poured down in buckets. Thunder rattled the bricks in the walls. Velasquez's illustrations are dynamic as they show Jazmin's energy and all the kids as they all splashed, banged, bashed, and clattered on the sidewalk. To see more of the pictures, visit Eric Velasquez's website. I'd pair this book with a bright red pair of rain boots, so kids could stomp and splash in puddles to their hearts delight. I really love this book. I've been meaning to review it on Storied Cities, but I haven't gotten around to it, yet (obviously). I'm so glad I happened upon your blog. What a great resource! The Rain Stomper looks adorable!